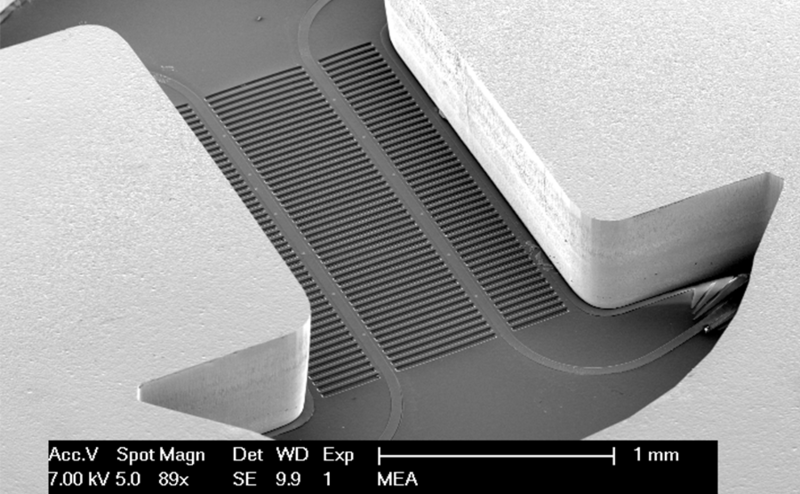 When developing a microfluidic device, there are many factors to consider: channel designs and sizes, control over critical dimensions, layer alignment, which type of materials or lithography processes can be used, etc. Think of what an experienced partner can do for you, imagine your development further down the road. Don’t you want a flexible development and reliable manufacturing company to ensure your device is brought to volume and to market quickly? Our experts are here to think along with you and accelerate your innovation with clever approaches in designing and manufacturing. We have been working on microfluidic technology for over 15 years now, and we are ready to share our knowledge with you. 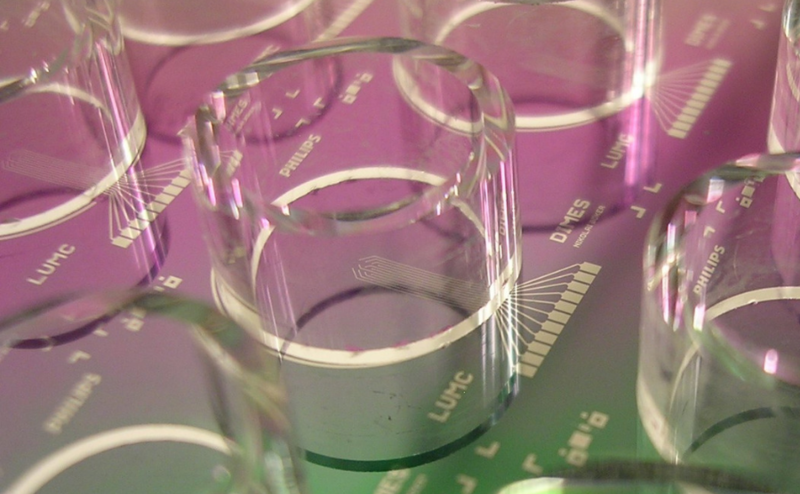 How can we help you with your microfluidic device? Micro-Electro Mechanical System (MEMS) are mechanical and electrical structures in silicon wafers using photolithography, etching and deposition processes to create structures for microfluidics. 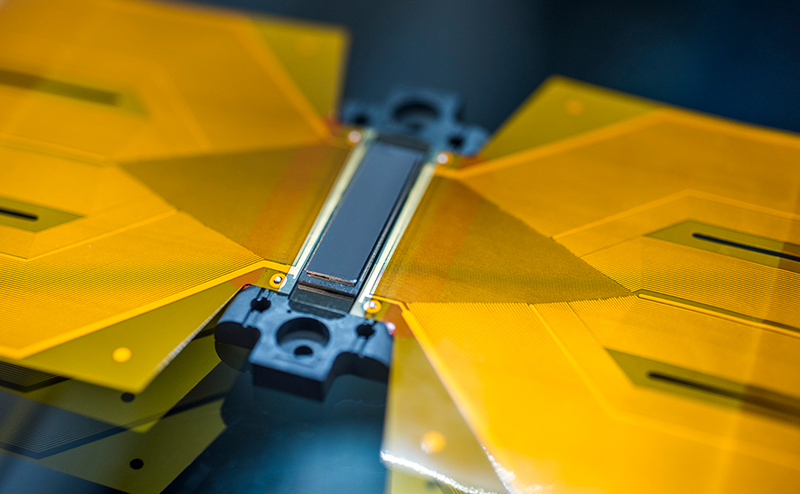 Using MEMS & thin film technologies like lithography, nano-imprint, dry and wet-etching, deposition, and a variety of laser systems, we can manufacture microfluidic devices in a range of substrate materials like silicon, glass, polymers or metal. Inkjet MEMS with integrated Piezo element and micro-nozzles in micro assembled butterfly package. Bio-MEMS for studying cell cultures, with membranes for molecular interactions and electrodes for impedance monitoring. 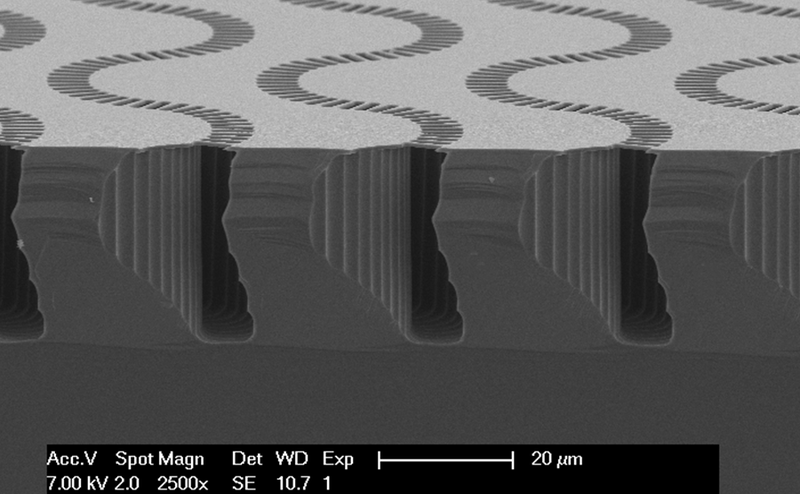 Novel processing method to achieve buried or membrane-capped micro-channels. Use capillary forces to fill micro-channels, chambers and glass reservoirs for simple fluid dosing. Integrating electrodes or metal thin films in u channels, from Ag to Zn. 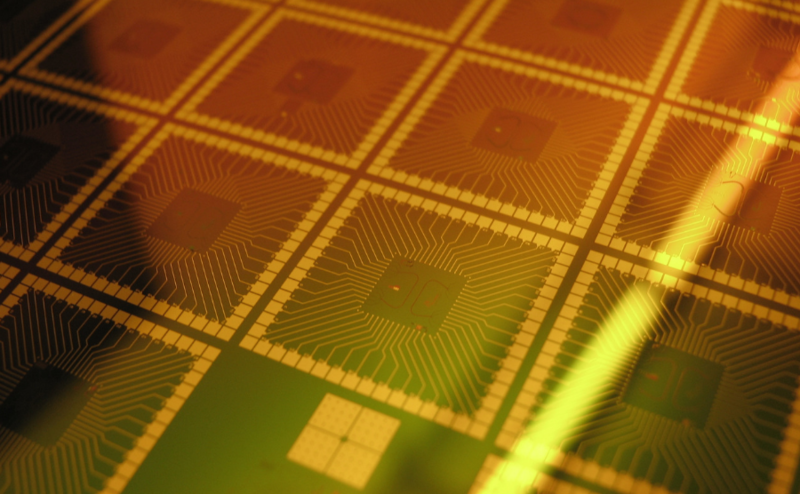 MEMS Foundry services involved in the manufacturing of microfluidic devices. We are Philips Innovation Services and we operate a state-of-the-art 2,650 m² pure-play MEMS foundry in Eindhoven, the Netherlands. We offer in-house MEMS & Micro Devices services. 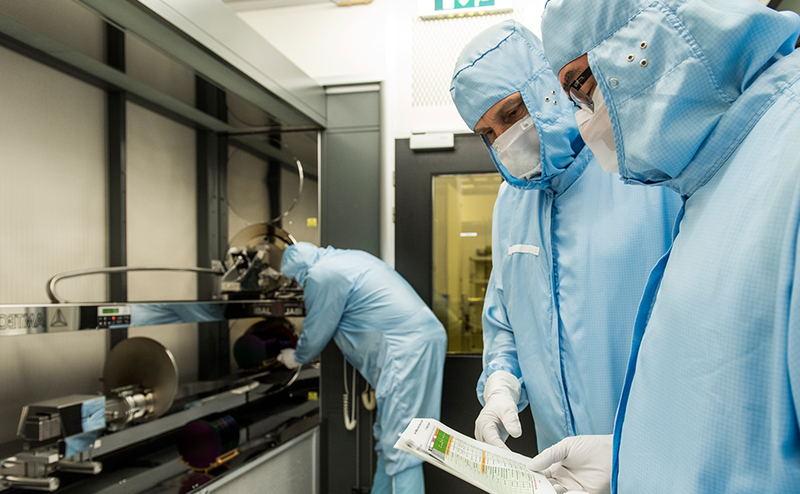 At the MEMS Foundry and Micro Devices Facility we offer advanced prototyping, development and volume manufacturing services for MEMS microfluidics devices, both for components and for complete module assemblies. Our MEMS technology enables high volume manufacturing and high levels of integration at a lower cost. You benefit from our expertise, built from developing and manufacturing a range of microfluidics devices. Our MEMS technology platform shortens design cycles and therefore your time-to-market. 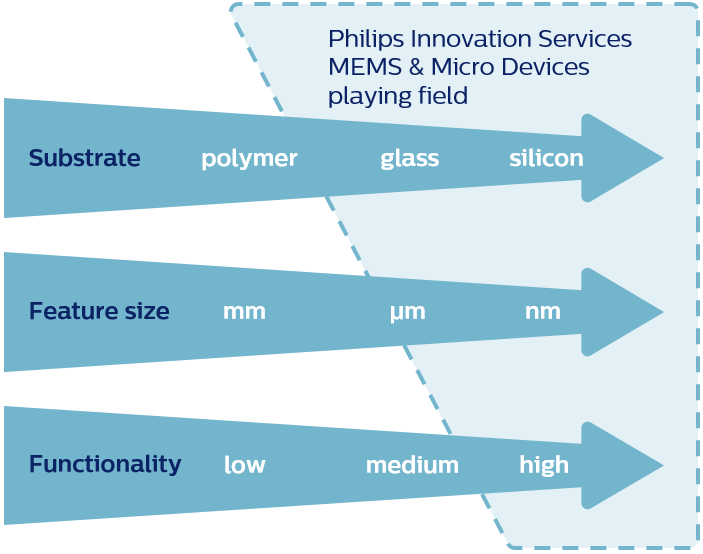 Partnering with Philips Innovation Services is the quickest way to obtain a reliable MEMS microfluidic chips. Sustainable competitive advantage through custom MEMS devices. Check out our services in the MEMS & Micro Devices key area of expertise.